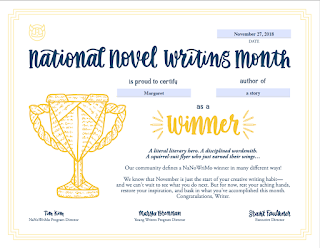 I did Nanowrimo (National Novel Writing Month) a few times, way back in 2002, 2004, 2005, and I think partly in 2006 (though I'm pretty sure I decided not to finish once I barely got through the month), and I really thought I was done with the whole thing, that I would never attempt it again, and would probably not write fiction again. Weirdly, doing all that fiction writing so many years ago led to non-fiction paid writing, including ghost writing, so it worked out professionally. Then I got into audio, then teaching and other stuff, so I thought fiction was gone from my life forever. At one point, when I started the fake blog (which I'm still doing), I started thinking about "what-ifs" so much to the point that I started writing an actual novel again. I was progressing okay, very motivated but not consistent, when someone at a writing group mentioned Nanowrimo. No way, I said, I'm not doing that, it's too intense and crazy, but at the end of October, I signed up, and started writing furiously on Nov 1. I almost quit after a few days because I realized my schedule was too packed to fit lots of writing in, but after reading some articles online about quitting, I decided not to. So I spent pretty much any free time I had, even if it was at 5 AM before work, writing and writing and writing. Halfway through I was dried out and thought I couldn't proceed. But some helpful people at the Chiwrimo group suggested I not only focus on plot but on developing the characters more, and I found myself writing a lot of interior thoughts and voila, after furiously writing all month, I actually finished a few days early. 2 - I didn't feel sorry for myself this time around. If you've read earlier posts on this blog (and I shouldn't mention that because it's embarrassing to see how I used to write here), you'll notice that I did a lot of whining. I whined way more in my journal and in my head, but I was such a sorry sap. And it carried over into Nano when I did it those few times. This time, I didn't feel sorry for myself at all, I just wrote and wrote and went for the goal. No time to ponder, just wrote as much as I could and was very productive. I didn't think about being published or being invited to cool events like those famous authors are (who are introverted and would rather be alone, which is mystifying, but that's for another post), I just was in the moment, which left no room for emotions except from my main character who really went through a lot. If I ever can finish writing the book and edit it effectively, you'll find out what I'm talking about. She starts out one way and ends up another way, and if I were a better writer I'd be able to convey that, but who cares...at least I'm trying. See? I've changed as well. She occupies my mind and her world has become an extension of mine, and I'm not crazy, just have a new companion around who I want to write about. 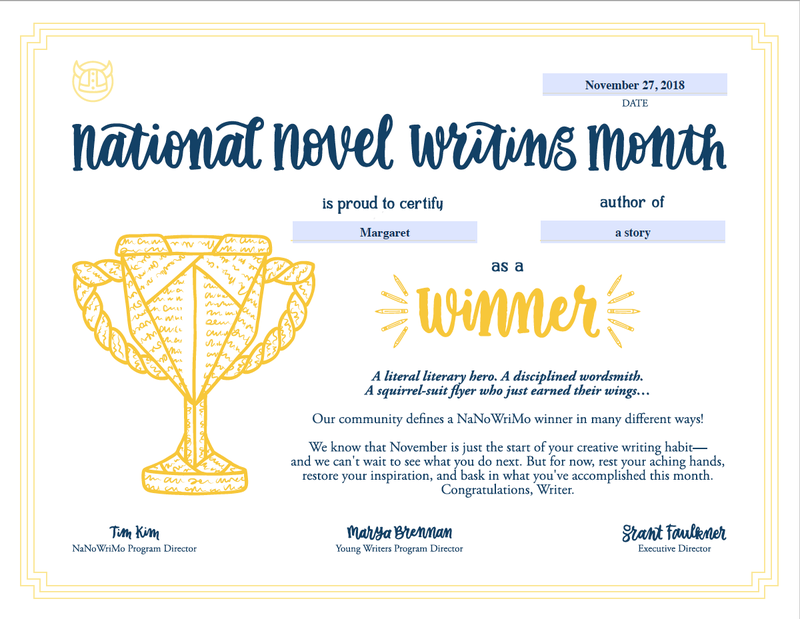 3 - Nanowrimo is huge now. When I did it years ago, it was an alternative group and corner of the Internet that a lot of people didn't know about. I think I found out about it via blogs, but because social media wasn't around, it didn't explode and wasn't the institution it is now. Now they have lots of money, sponsors and deals, professional authors giving pep talks, groups all over the world, a sophisticated website, a more layered financial and social structure, and a lot more. Back then I felt like we were in a small town, at least those of us outside the San Francisco area, where Nano was established. It's sort of like being in Macao before it was handed back to China: it was a quiet place in the corner of Asia, not the wild development that it is now. 4 - I don't want to do it again. I don't know why I did it 3.5 times back in the day, but now that I've done it again, I really can't handle the experience once more. I might change my mind next year because it's a crazy all-consuming pursuit that puts you on a wild ride of intensity, and my life might need that at that moment, but it really took up all my free time. I didn't even have time to blog here or fake blog elsewhere. I didn't even write in my journal. Any time I had to write was devoted to Nano, and I don't know if I want to lack the breathing space again.